Last week I mentioned that I am currently working on a laundry room update. And as I also mentioned, in all honesty, I don't actually have a laundry room - it's really a laundry closet. But I spend a great deal of time using my laundry area. And right now, let's just say that it's less than inspiring. So I decided to do something about that. And today I wanted to share with you all, the inspiration board I have come up with for the space. 1. Kelly Wearstler Imperial Trellis. I am *in love* with this pattern. And I am also infatuated with the color green right now. I can't wait to show you how I incorporated a similar pattern (and this color) into the space. It's AWESOME! 2. A countertop. I currently have nowhere to fold clothes, and I really hate it when clean laundry falls off the top of the washer or dryer and lands on the floor. Grrr. So I'm going to remedy the situation by adding a counter. 3. Pretty baskets. There is already a wire shelf above the washer and dryer. It's not necessarily the prettiest thing, but it's functional. And I can make it a lot better looking by adding some of these pretty baskets to hold all my laundry odds and ends. 5. A chandelier. A little bling never hurt anybody. I'm currently crushing on this petite and pretty chandelier from IKEA. It might not be my final choice, but it's definitely in the running. So there you have it. 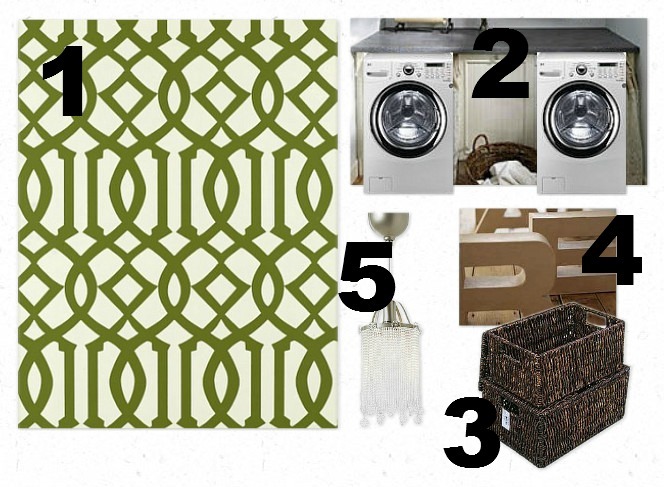 The laundry room closet plan. I'm working hard trying to get it done...so hang in there! Hopefully, I'll have a big reveal coming your way soon! Oh, love everything on your inspiration board - can't wait to see! !